18" x 14.5" five-rail pedal board with your choice of case. 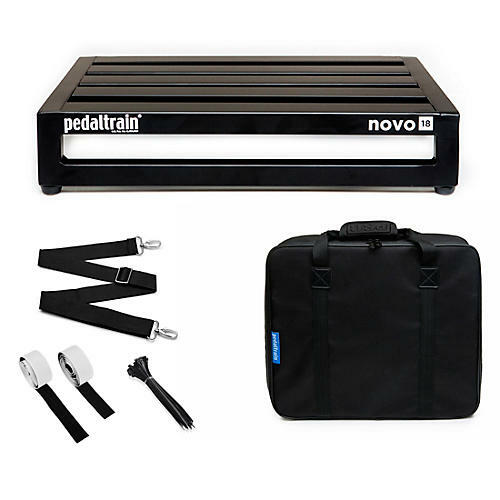 Novo means œa new beginning in Latin, and Pedaltrains Novo Series five-rail pedal boards are exactly that, a fresh redesign of their market-leading pedal board design. Thanks to Pedaltrains modified rail system and open front design, mounting pedals and power supplies is easier than ever. Even the smallest pedals make an incredibly strong bond with this rail system. Novo 18s five-rail design is perfect for players who use true-bypass switchers or need an extra rail to accommodate a variety of pedal configurations. And as always, Novo 18 is made with Pedaltrains signature featherweight aircraft-grade aluminum. Included with purchase is 90 (229 cm) of Pedaltrains professional grade hook-and-loop pedal fastener and plenty of zip ties for securing cables and your choice of a redesigned fitted soft case (featuring a heavy-duty metal zipper and reinforced stress points) or Pedaltrains professional-grade tour case. Add this pedal board to your setup with a quick click or call today!